Working abroad has had a major impact on the way my/our lifes have developed. From an almost accidental start in 1977 in the "Black Angel Mine" in Marmorilik, Greenland, through Asia and Africa, to a last stop (?) in Lebanon, travelling and working in foreign and unfamiliar environments became a way of life. Looking back, it has been an enriching experience, with lots of memories to look back on, some of them sad, but most of them of a happy nature. A stroke of faith provided the beginning, being young and independent, a vacancy for a surveyor in the Black Angel Mine just happened to pop up on a day with a little dissatisfaction at what was my second job after graduation and military service. An application was sent off without too much thought of the possible consequences, but 3 weeks later, on 25th July 1977, I was off on my first major travelling experience. The Black Angel lead-and zinc mine was located near Umaanak app 300km north of the arctic circle on the west coast of Greenland, founded and operated by a Canadian corporation. The mine itself was located app 600m above sea level, and reached by cable cars from across the fjord were offices, treatment plant and housing facilities were located. Work went in a steady routine, 10 hours a day, 6 days a week, followed by a good enjoyable dinner on saturday night, occasionally accompanied by a glass of wine or two (except for the periods were alcohol rationing was enforced), then a sunday to relax, and starting all over again on monday. Located well above the arctic circle Marmorilik had a long dark and depressing winter period, only partially compensated by a spell of midnight sun in the summer period. However, a work/holiday scheme of 4 months on/4 weeks off made things quite tolerable, as did the convenient accomodation with single room w/bathroom, and the canteen service, which was more than adequate. In those days working on Greenland was still financially attractive, as only a 25% local tax was applied. However, a 2 year minumum stay was required to avoid having to pay normal Danish tax. Having passed the 2 year mark I considered leaving, but as the post of Chief Surveyor became vaccant I was persuaded to soldier on, eventually doing so for another 3 years. As so many of many colleagues I travelled extensivelly during my holidays, mainly in Asia, Sri Lanka and Thailand being the favourites, enjoying this opportunity to see the world. Eventually it all became a bit too much routine, and so I left on 3rd January 1983, a beautiful winters day with a clear sky and -47 degrees celsius. The stay in Greenland was followed by an extended period in Thailand, then a return to Denmark, with two not-quite-satisfying working experiences, so when the opportunity came to join Pihl and Son a/s in Mukallah, PDRY (South Yemen) I didn't hesitate. There were some great differences to working in Greenland, mainly of course the climate, where the winter in Greenland brought snow and temperatures below –30, Yemen had >+30 degrees everyday, and rain about every 2nd year! Accommodation however was more on a similar note, living in nice single rooms/apartments, but in a fenced camp with absolutely no contact to the local Arabic population. The project included land reclamation works and installation of sewer lines in the narrow alleys of downtown Mukalla, a provincial city of about 65.000 inhabitants. While work in general was a bit monotonous, a distraction came with the civil war in 1986, when we, together with almost all other foreigners were evacuated. Our “escape” started in the hold of a Liberian freighter that brought us (app 250 person of app 40 different nationalities) from the harbour of Mukalla to a rendezvous with the HMS Newcastle in international waters, then a transfer by helicopter, and an onward journey to Djibouti, from where we were flown out via Cairo. Fortunately the unrest didn't last long, and after a month we were back again. Eventually I stayed on in Yemen until the end of the project in 1989, figuring that I'd seen enough of deserts to last for a lifetime…. After the arabicc adventure I took time to travel around the world with a colleague, passing through Canada, USA, Fiji, Australia and Thailand - a nice way to compensate for the boredom of life in a very restricted environment. 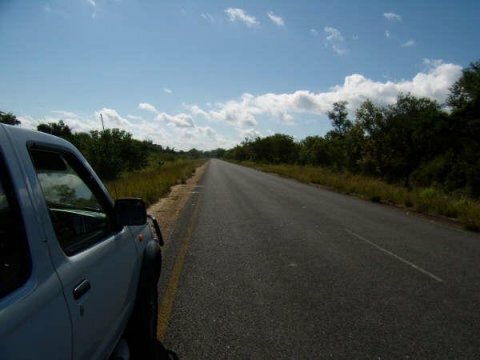 After a brief period on the beach, I was invited by Pihl to join a road rehabilitation project in Tanzania, spanning app 245 km from Chalinze via Segera to Tanga. A camp was being erected near the village of Kitumbi, app 300km from Dar-Es-Salaam, from where it was reached after a gruelling 6 hour journey on a practically non-existing road surface. It was easy to feel at home in the camp, since most of it had travelled from the previous project in Mukalla, as had quite a number of my colleagues. That apart, we soon learned that we'd come to quite a different place, many arguing that this was only fair and reasonable after 4 or 5 years in the desert. Whereas the landscape in Yemen had been in shades of yellow and brown, in Tazania green was the colour, with an incredible vegetation anywhere you went, and while the climate was still warm, it felt a lot more tolerable. What helped even further to make life tolerable was the absence of restrictions on contact with the very friendly local population, and the availability of alcohol. While you still had to travel perhaps 30 minutes on a rough road to find a bush bar serving a warm “Safari” (the local beer), it still felt like an improvement, and this became even better as, during our stay, import restrictions on foreign beer was lifted, and electricity reached most villages, to allow installation of refrigerators in most of the bars. After the usual slow start with discussions on asphalt recipes etc, work eventually got under way. Being in charge of the survey section, I was accompanied by one expat assistant, and immediately started recruiting local staff to build what eventually became a well running organisation, with many skilled and dedicated surveyors and chainmen/chaingirls, that are still fondly remembered. 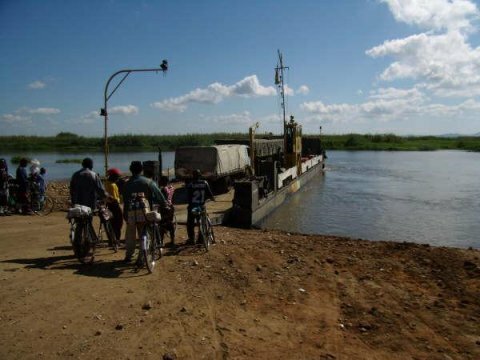 Eventually the whole project got well under way, with good steady progress, except for the rainy seasons, Bridges were built, culverts laid, and the road reconstructed and –surfaced, to an extent that most of it can still be found in prime condition 15 years later. During the project we fortunately also found time to visit some of the wildlife parks, like Mikumi og Ngorongoro, truly amazing experiences. Work was carried out in a good-natured atmosphere between management, expat staff, TCN's and local labourers, giving most of us a good and satisfying experience. The African adventure ended in December 1993, and I went to work for Pihl in Denmark, on the preparations for the Øresund bridge. A Danida financed road project in Bangladesh was expected to come up shortly afterwards, but due to financial restraints and negotiations it didn’t come off the ground until april/may 1995. From the beginning the Bangladeshi project was different, starting with the accommodation, where we would leave the traditional camp in the bush, and instead live in rented houses/apartments near the capital Dhaka. Secondly, I arrived as only the second expat in the country, shortly after the site manager, Leif M Mikkelberg, and got involved in a lot things during the mobilisation that had very little to do with surveying. The surveying initially involved measurements, before and after unloading, of ships carrying boulders from the Sylhet area, to be crushed and used in the construction. Simultaneously, in-survey of the existing road was carried out, with the aid of two survey teams from a local surveing company, Design Survey Consultants. Eventually most of the staff found accommodation in Banktown, a residential area near Savar, app 25km from Dhaka, an area developed by one of the major banks for it’s senior employees, many of whom were able/willing to rent out their houses for the duration of the project. Whereas living in camps had been quite OK, with the standard of housing found, this was a definite step forward. Life in Bangladesh was an experience in itself. The low-laying country is densely populated, and especially in Dhaka the traffic was incredible, with buses, rickshaws and saloon cars competing for space, traffic jams being the rule, often lasting for several hours, and making any trip downtown a bit of a gamble. After 8 month on bachelor status I was able to bring the family out in April 1996, and as quite a number of colleagues were also on family status, social life developed well in Banktown and Dhaka. As we learned during the early days, when we were hunting for bargains on anything from trucks to desks and teaspoons, shopping possibilities were many and diverse in Dhaka. Several well equipped markets in Gulshan and Banani provided food, especially vegetables and seafood at a very affordable price, and several markets and shopping centres carried clothes, jewellery and just about anything else you could wish for. During our early days in a guesthouse in Banani, we did a lot of exploration into the restaurant life in Dhaka, some expeditions more successful than others. On one memorable evening we walked for app 3 km into what eventually became an industrial area, until being rescued by a police officer who realized that these foreigners were obviously in the wrong place, and another occasion we ended up in a gallery, rather than a restaurant. We did however also find several places with food of extremely good quality, and at quite reasonable prices, ranging from the fast food at Sausley’s over several Chinese style places, to the splendour at the Sheraton and Sonargon hotels. The all-time favourite however was the Italian style “Spaghetti and Jazz” which, especially for my colleague Carl Erik Schwarz and myself, became THE place to go. An interesting aspect of eating out was that only the 3 biggest hotels in town had a license to sell alcohol, but several of the others, including Spaghetti and Jazz, allowed customers to bring their own supplies, fortunately. During the time in Bangladesh, we had the opportunity to travel both to Delhi and Katmandu, Nepal, both trips giving a chance to see some of the most fascinating scenery. To Katmandu we travelled in style, with 3 children and our beloved housegirl Rina, who enjoyed her first flight, and her first trip abroad. The construction project itself came to a somewhat erratic start, mainly due to political unrest during the early months. Several one-day “hartals” (general strikes) were called, during which it wasn’t advised to venture outside your immediate neighbourhood, this escalating into a 3week general strike, which fortunately coincided with the World Cup in cricket, which was extensively covered on the local TV-channels. After the unrest, work got well under way, and we ended up with an extremely successful project, a rare occasion were Consultants, Senior management, expats staff and local workers worked smoothly together, to eventually complete the 75km of road from Savar to the ferry in Aricha well ahead of time. The time in Bangladesh provided a little side trip to Palestine during one of the rainy seasons. The company was working on a EU finaced project, repairing 4 sections of road in Nablus, Jenin, Jericho and Bethlehem, and I was asked to stand-in for 3 weeks, as a new permanent surveyor was being found. Workwise it wasn't too interesting, but it gave me an unexpected opportunity to visit some intereting historic sites. Before the Bangladeshi adventure finished, a return to Tanzania was being planned. The 100km road from Dar-Es-Salaam westwards to Chalinze had been under reconstruction by an Italian contractor while we were working in Kitumbi. Somehow however, they managed only to complete the 50km closest to Chalinze, and we were then requested to reconstruct the remaining part to Dar. Accommodation was found in the former Italian camp in Mlandizi, app 55km west of Dar, though it required quite a bit of carpentry to bring it back to a reasonable state. Camp life in Mlandizi proved to be quite a bit more comfortable than in Kitumbi, largely due to having the shopping and entertainment facilities of Dar within reach, and to a minor extent due to the swimming pool and bar that was established inside the camp. The project had the classic slow start, but eventually developed reasonably well. A new technique of using the French method of mixing sand with leftovers form iron production “Pozzolan” required a bit of “getting used to”, and a consultant that wasn't too cooperative also had some influence on the result. The camp was equipped with a satelite telephone through which Europe could be reached, but at considerable cost. 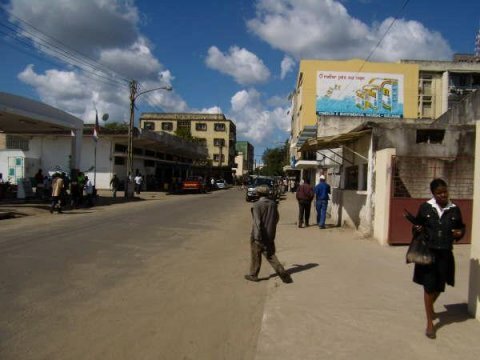 However, during the years we spend on the project, big changes started to occur in communication possibilities: a number of internet cafes appeared in Dar, albeit with shaky connections and frequent breakdowns; and the mobile phone started to appear. 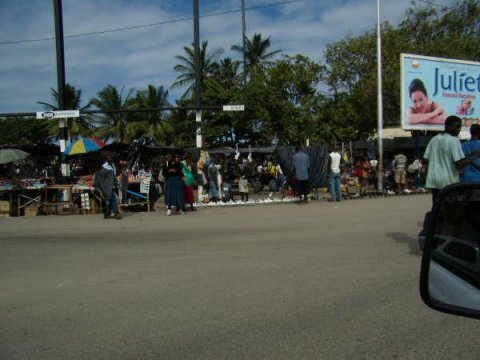 Initially coverage was limited to downtown Dar, but at the time we left in 2001, most major cities, as well as Mlandizi was covered (though sometimes you had to know which little knoll to stand on!) making it possible to communicate more frequently with the family back home, thereby easing conditions considerably. Returning from Tanzania in the summer of 2001 was followed by a number of minor tasks in Denmark, and a 2 week trip to Kulusuk in East Greenland. It was quite interesting to return to Greenland after an 18 year absence, although for a very limited period. 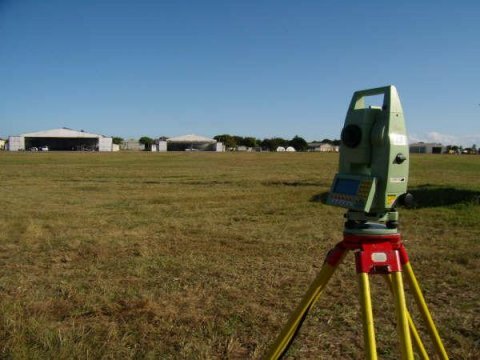 The task at hand was an in-survey for a rehabilitation of the runway at the airport, and while we were able to carry out this in good order, our stay will mainly be remembered for watching the events of 9/11 on TV! Consequently, the journey home via Iceland was marked by some very careful security checks! One of the tasks in Denmark brought me to the basement for the Opera house in Copenhagen at 12m below sea level, and it's somehow a nice thing to be able to claim participation in this very special project. In the beginning of 2002 the call came for something entirely different, both geographically and work wise. 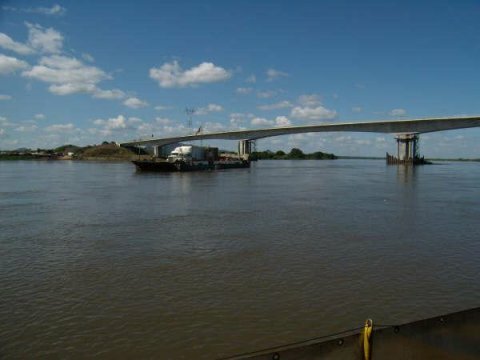 Pihl had won a contract from the EU for strengthening the banks of the Piastowski channel near Swinoujscie in north-west Poland, involving a lot of underwater excavation and stone placing, and subsequently a lot of bathymetric surveys. The world of echosounders, RTK GPS, sound velocity measurements etc was something quite new, as was the GPS-based machine control systems installed on the excavators doing the excavation and stone laying, but eventually we got it all running. While we had a set-up with only 4-5 Danish expats, we were able to recruit quite a number of excellent Polish colleagues, including quite a few from the local computer store, who showed great skill and ability to adapt to the special job on hand. Accommodation was found in very nice rented apartments, and as prices on foodstuffs were very reasonable, as was dining outside, we enjoyed a good standard of living. The schedule included a long weekend (Thursday – Tuesday) in Denmark per month, with a choice of travel by either to overnight ferry to Copenhagen, a flight from Szczecin or an overland drive through Germany. Together with the good and cheap telephone and internet connections, this provided for fairly good contact with the family at home. Swinoujscie, or Swinemunde as it's called I German, is situated right at the border to Germany, this providing both German radio coverage, and a lot of bargains on the border markets. While the financial rewards were less than on overseas projects, there were many positive aspects of working on this project: a small, well functioning team, good living conditions, new advanced technology, and the close proximity to home, the only sour drop being the Polish consultant who apparently hadn't noticed the end of the cold war, and repeatedly hinted at the warships lying in the harbour, previously destined to participate in the invasion of Denmark!! Eventually things ended with an arbitration case in Szczecin in 2006, in which the consultants fortunately lost on all counts. However, the bathymetric skills developed in Poland were in 2005 required again, and again under new and different circumstances. In cooperation with the Belgian contractor Besix, a jetty for LNG-tankers was to be constructed in Malabo, Equatorial Guinea, in West Africa. Pihl had already been working successfully in the country for several years on a number of harbour projects etc, and was well established in Malabo, for this joint venture however accommodation of the staff was provided in the camp erected specially for the construction project. The camp housed a considerable number of people from various contractors and countries, but while the housing and dining facilities were actually of a good standard, the strict security arrangements etc somehow cast a shadow over things, creating a somewhat drab, prison-like atmosphere. After the standard bathymetric in-survey work consisted of piling of 60m long, 120cm DIA steel piles, followed by placing of pre-cast concrete elements. Work was carried out from Besix's special jack-up platform “Pauline” equipped with GPS equipment for position of the barge and the piles. Again, some new technologies were learned, and some more experiences added. The main part of the work force was provided by Besix, consisting of course mainly of French speaking Belgians, but also with Italian, Portuguese and German participation, and a TCN staff from India. Again, the work schedule was a new experience, piling work was carried outround the clock from the Pauline, 13 days in a row, with a shift change every 2nd Sunday. The large number of working hours were then compensated by a 19 day leave every 3rd month. The work schedule didn't leave much time for sightseeing, but with the help of my Danish colleagues working on other projects in the country I managed at least the occasional work-related visit to these projects. Overall, the Malabo experience provided valuable experience on new technologies, but also appreciation of the Danish management style, which is quite remote from the “need-to-know-only” method applied by our Belgian colleagues. Before the Malabo project finished, I returned to more familiar working areas, when work on the 100km long “North Coast Highway Improvement Project 3” from Ocho Rios to Port Antonio in Jamaica started early in 2006. I appreciated getting the opportunity to work in a different corner of the world, and the chance to see the expected tropical paradise, and though the phrase “Paradise” didn't always suit the reality, it was quite an interesting experience. Work itself was basically similar to previous road projects, although the survey staff this time included senior surveyors from diverse places such as Zambia, England, Honduras and the Philippines, but still with the majority made up of local Jamaicans. On the request of the original production management machine control systems were adapted for the graders on the project, this however turned out be a mixed blessing, as the management was later replaced by a group favouring more traditional methods of working, this eventually leading to cutting of all cables for the system on the graders!! The were interesting aspects in working in Jamaica, one of them being the many land owner disputes, which often halted progress, when the contractor was (occasionally at gunpoint!) prevented from working in the areas he desired. While accommodation was provided in apartments in and around Ocho Rios at the western end of the project, a very convenient system of “if you can find something yourself” was introduced, and so I ended up in Tryall, a housing scheme near Baileys Vale, outside Port Maria, only 10 minutes drive from the main site in Llanrumny, together with Ken Toye, an old colleague from Kitumbi, Bangladesh and Mlandizi. Port Maria was a rather quiet place, lacking the shopping and dining facilities of Ocho Rios, but a number of watering holes in Free Hill and Baileys Vale provided the necessary basic services. Unfortunately crime and violence is ripe in Jamaica, and we suffered our share, the worst case being the murder of one of our foremen, while robberies and theft were quite common, I excelled by being the first to have a car stolen from outside our house, and later being the first to have a second car stolen! As for sunny, palm tree lined, white beaches it was a bit of a disppointment, the best ones found during a trip with the family to Negril, past Montego Bay at the western tip of the Island. Other “highlights” during our stay were the flash floodingin Port Maria, and the hurricane in 2007, that left us without power and water for app 2 weeks. And then again, as they say "it aint over till it's over", and so in december 2008 I got the chance to revisit Jamaica for 12 days, doing a small condition survey of a side road to "our" main road, this one leading from Hope Bay up in the mountains to the small village of Durham. To call it a road did at times seem like exaggeration, starting with a fair, paved, road of about 6m width, we ended up with a 3m track balanced on the edge of a sheer drop of 2-300m! Still, it was a good opportunity to see some parts of the finished road from Ocho Rios to Port Maria, and to meet some of the old colleaugues. 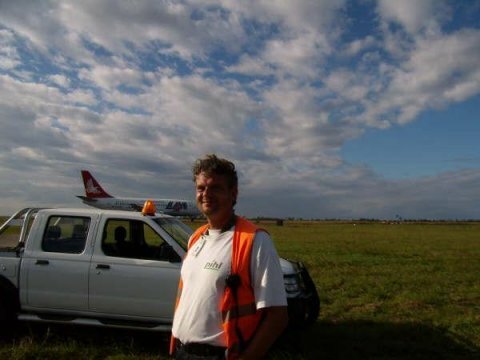 June 2009 offered another chance for a little trip abroad, this time to Mozambique, where the company was involved in rehabilitation of 3 regional airports. 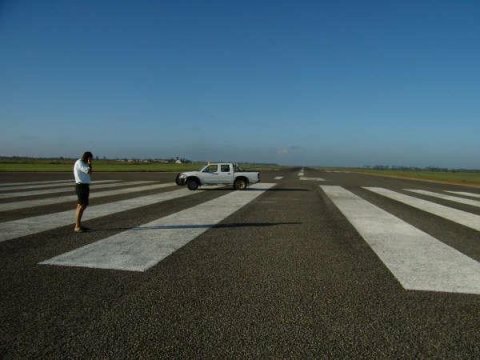 Travelling via Frankfurt and Johannesburg, I arrived in Beira on June 15th, right at the scene of some of the work at hand, an as-built survey of the asphalt overlay on the runway in this airport. 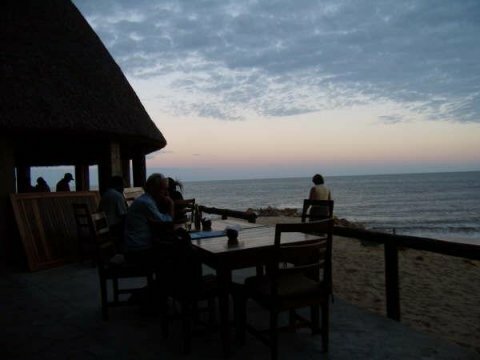 Visiting Mozambique was quite interesting, the landscape, architecture and people quite similar to their northern neighbours in Tanzania, only the use of Portuguese as the main language making communication with the locals somewhat difficult. Workwise it was also a good experience, reinventing some of the old skills, and trying to pass them on to the surveyor on site, Christoffer Lach, who proved to be an excellent host during my stay down there. The food available at local restaurants was generally of a very good quality, especially the seafood, and prices quite reasonable. And then, in June 2010, yet another trip abroad, to the sunny Middle East (sunny, well, most of the time at least!) - to the extension of Q16, the Container terminal in Beirut, Lebanon. A job with lots of Bathymetric surveys, with all that entails of fun and games in the GPS-department, as well as a lot of machine-guidance stuff.